Welcome to the website for MONKEY JUNGLE! Click on the above links for song clips, illustrations, and more, including how you can Order Your Own Copy Right Now On-Line! 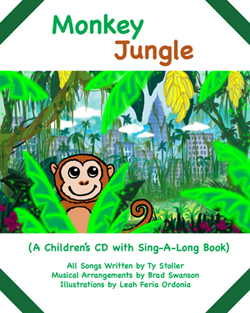 You can also find Monkey Jungle at: STORYOPOLIS in Sherman Oaks, CA. AMOEBA RECORDS in Hollywood, CA. The Creative Child Magazine Award!!! This album features a catchy Clean-Up song, a brand new original Piñata song, and the Alphabet backwards! From Rock to Reggae, this record has it all! !....For that music collection, this album will continue to grow with your child!.....For you adults out there, this album could be for that child, that's within us all.